Some of you may already know that EnMart carries the Rowmark MATES product. We offer MATES in 8.5 x 11 sheets and in 12 inch x 50 foot rolls. The MATES line is very versatile and can be used for a variety of applications. 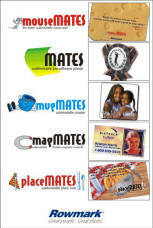 Basically, MATES are sublimatable pre-adhesive flexible plastic. The product is ideal for signage, name plates, award plaques, packaging and many other uses. Rowmark also notes that White MATES can be pressed with the backing down between two pieces of sacrificial paper. While MATES are generally very easy to work with, there may be occasions when issues crop up. Fortunately, Rowmark has provided solutions for the common problems that may occur. If you have poor color saturation or your colors have a pastel appearance it may indicate insufficient pressure, time and/or temperature. Try increasing each of these items one at a time to see if that corrects the problem. If you are using the Power Driver software, you could also try setting the Vector Color Management to “none”. If you are getting a double image when pressing, it could indicate that the transfer is moving after the press is open and before the dyes have cooled. Make sure the transfer is attached securely to the MATES product and be sure to open your press slowly and smoothly. If you get a bubbling appearance when pressing the white MATES, your time, temperature and/or pressure may be too high. Try reduce the time, temperature and pressure to see if that eliminates the issue. You may also want to consider purchasing and using a digital pyrometer to make sure that your press temperature gauge is accurate. To find more MATES troubleshooting tips, visit the Rowmark website.